Recognised as official in courts, education and legislative assembly of Ontario. The attested historical range of Plains Sign Talk among other sign languages in the US and Canada (excl. ASL and LSQ). 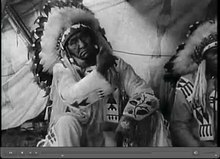 Extracts of the films taken during the 1930 Conference on PISL conservation, showing signers from various tribes. 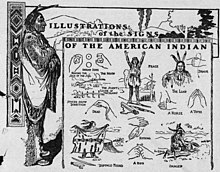 A 1900 newspaper illustration claiming to showcase several of the signs of Plains Indian Sign Language. Plains Sign Talk's antecedents, if any, are unknown, due to lack of written records. But, the earliest records of contact between Europeans and Indigenous peoples of the Gulf Coast region in what is now Texas and northern Mexico note a fully formed sign language already in use by the time of the Europeans' arrival there. These records include the accounts of Cabeza de Vaca in 1527 and Coronado in 1541. As a result of several factors, including the massive depopulation and the Americanization of Indigenous North Americans, the number of Plains Sign Talk speakers declined from European arrival onward. In 1885, it was estimated that there were over 110,000 "sign-talking Indians", including Blackfoot, Cheyenne, Sioux, Kiowa and Arapaho. By the 1960s, there remained a "very small percentage of this number". There are few Plains Sign Talk speakers today in the 21st century. William Philo Clark, who served in the United States Army on the northern plains during the Indian Wars, was the author of The Indian Sign Language, first published in 1885. The Indian Sign Language with Brief Explanatory Notes of the Gestures Taught Deaf-Mutes in Our Institutions and a Description of Some of the Peculiar Laws, Customs, Myths, Superstitions, Ways of Living, Codes of Peace and War Signs is a comprehensive lexicon of signs, with accompanying insights into indigenous cultures and histories. It remains in print. Sign language use has been documented across speakers of at least 37 spoken languages in twelve families, spread across an area of over 2.6 million square kilometres (1 million square miles). In recent history, it was highly developed among the Crow, Cheyenne, Arapaho and Kiowa, among others, and remains strong among the Crow, Cheyenne and Arapaho. Signing may have started in the south, perhaps in northern Mexico or Texas, and only spread into the plains in recent times, though this suspicion may be an artifact of European observation. Plains Sign Talk spread to the Sauk, Fox, Potawatomi, Cherokee, Chickasaw, Choctaw, and Caddo after their removal to Oklahoma. 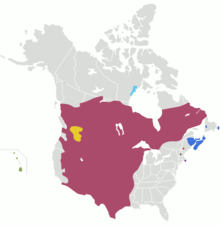 Via the Crow, it replaced the divergent Plateau Sign Language among the eastern nations that used it, the Coeur d'Alene, Sanpoil, Okanagan, Thompson, Lakes, Shuswap, and Coleville in British Columbia, with western nations shifting instead to Chinook Jargon. A distinct form is also reported from the Wyandot of Ohio. It is known that Navajo has a comparably sizeable population of individuals who can speak the Navajo dialect of Plains Sign Talk. There is also an unrelated sign language, Navajo Family Sign, in a clan of Navajos that has several deaf members. There exists a variety of Plains Sign Talk within the Blackfoot Confederacy. Little is known about the language beyond that it is used by Deaf community members, as well as by the community at large, to pass on "oral" traditions and stories. Location—this involves the spatial placement of a sign. Signs may change meaning when placed in a different location, for example, in front of the face as opposed to in front of the torso. Movement—this involves, as implied, the way the hands move when forming the sign. For example, in Plains Sign Talk, the signs AFTERNOON and MID-DAY form minimal pairs as they are both formed exactly the same, the only difference being that MID-DAY is stationary and AFTERNOON moves from above the head to the side in an arching motion. Handshape—as implied, each sign takes on a certain shape in the hand, called a handshape. The handshapes of signs are a very key parameter. For example, the signs YES and I-KNOW are the same in all parameters except for the handshape; in YES the hand makes the Plains Sign Talk J shape, and in I-KNOW the hand takes the L shape. Orientation—this refers to the orientation of the palm. This is clearly seen in the Plains Sign Talk words ABOVE and ADD. Both involve having the left hand act as a base from which the right hand rises, and both have the same location, movement, and handshapes; however, in ABOVE, the non-dominant hand is palm down, and in ADD the non-dominant hand is palm up. There may be other parameters, such as facial features. However, these function like suprasegmentals, and the four parameters listed above are the crucial ones. Although the parameters of sign are listed separately below, in actuality they co-occur with the other parameters to make a single sign. It is not clear how many of the differences were distinctive (phonemic). Plains Sign Talk uses the following locations. The various neutral spaces are the most common places for signs to occur. These are the directions towards which the palm can face. The movements below are found in Plains Sign Talk. They may be repeated in certain situations. As most Native American languages lacked an indigenous alphabetic tradition, and as Plains Indian Sign Language was widely understood among different tribes, a written, graphic transcription of these signs is known to have functioned as a medium of communication between Native Americans on and off reservations during the period of American colonization, removal, and forced schooling in the late 19th and early 20th centuries. The letter of a Kiowa student, Belo Cozad, in 1890 sent to Carlisle Indian School in Pennsylvania from his parents on a reservation in Oklahoma made use of such signs and becomes one of the only known indigenous written transcriptions of the Kiowa language. ^ a b c Province of Ontario (2007). "Bill 213: An Act to recognize sign language as an official language in Ontario". ^ Hammarström, Harald; Forkel, Robert; Haspelmath, Martin, eds. (2017). "Plains Indian Sign Language". Glottolog 3.0. Jena, Germany: Max Planck Institute for the Science of Human History. ^ Darin Flynn. "Canadian Languages". University of Calgary. Retrieved August 8, 2015. ^ "Native American Hand Talkers Fight to Keep Sign Language Alive". www.voanews.com. Retrieved 2019-03-19. ^ Wurtzburg, Susan, and Campbell, Lyle. "North American Indian Sign Language: Evidence for its Existence before European Contact," International Journal of American Linguistics, Vol. 61, No. 2 (Apr., 1995), pp. 153-167. ^ "Plains Indian Sign Language". ethnologue.com. ^ a b Supalla, Samuel J. (1992). The Book of Name Signs. p. 22. ^ a b "Language". Blackfoot Crossing Historical Park. Retrieved October 5, 2015. ^ Davis, Jeffrey; Supalla, Samuel (1995). "A Sociolinguistic Description of Sign Language Use in a Navajo Family". In Ceil, Lucas (ed.). Sociolinguistics in Deaf Communities. Gallaudet University Press. pp. 77–106. ISBN 978-1-563-68036-6. ^ "Who put Native American sign language in the US mail? - OUPblog". oup.com. 9 May 2018. Bergmann, Anouschka; Kathleen Currie Hall; Sharon Miriam Ross. "Language Files". USA. Ohio State University, 2007. Bureau of American ethnology. "Annual report of the Bureau of American ethnology to the Secretary of the Smithsonian institution". Washington, DC. Government printing office, 1881. Cody, Iron Eyes. "Indian Talk". CA. Naturegraph Publishers, Inc, 1970. Davis, Jeffrey E. "Hand Talk". USA. Cambridge University Press, 2010. Newell, Leonard E. (1981). A stratificational description of Plains Indian Sign Language. Forum Linguisticum 5: 189-212. "Letter Signs in Plains Indian Sign Language, Image in Harper's Magazine (March 1880)"
This page was last edited on 17 April 2019, at 13:21 (UTC).